Mommy Monday: Amy discussed the trails at Disney's Animal Kingdom and why they are so great for toddlers. Team Tuesday: The Growing Up Disney family gave their favorite stage shows at Walt Disney World. Photo Flashback: Relax with these shots of Castaway Cay, Disney's private island. 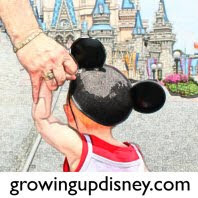 Guest Post: Janine shared her experiences at WDW as a vegetarian. Meet: We invite you to meet up with us and other Disney fans later this month at Disney's Hollywood Studios.